During the hottest months of the year, the last thing you want is for your air conditioning to go out. Unfortunately, too many people neglect to maintain their A/C units properly. This often leads to the A/C malfunctioning at the worst possible time. Rather than assuming that you need to replace a malfunctioning unit, it is best to pick up your phone and call our air conditioning service for repairs. Because a new unit can be quite expensive, costing as much as several thousand dollars, it is often more cost-effective to have your unit repaired. In fact, you can extend the lifespan of your A/C by having it inspected and maintained on a regular basis. Doing so can help spot any signs of trouble before they become serious so that they can be repaired right away. Once the weather starts to warm up, call us to schedule an inspection. Having your A/C inspected on an annual basis will help you avoid many problems. You want to do this as soon as possible so that any needed repairs can be made immediately. This way, you will not have to worry about turning on the air conditioning during a heat wave, only to have it fail. 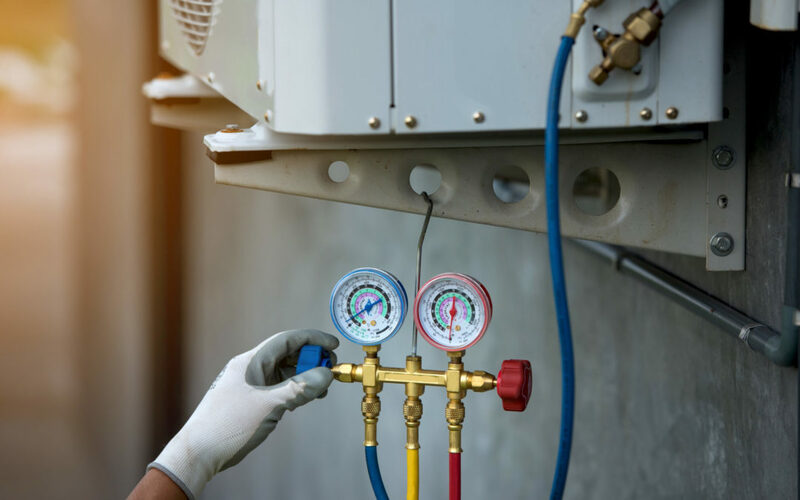 While there are some simple things that homeowners can do to keep their A/C running smoothly, a proper inspection needs to be performed by an experienced technician. S.A.A.B. Plumbing and Heating is EPA 608 and 410A certified and guarantees that our Service goes Above And Beyond by offering 1-year parts and labor warranty on all S.A.A.B. provided products. Some key points our inspections will include one of our technicians to check the voltage to make sure that it is at the proper level. It is always a good idea to hire a professional any time that electricity is involved. Keep yourself and your family safe by letting an experienced HVAC technician handle this work. S.A.A.B. Plumbing and Heating takes pride in providing quality plumbing and HVAC services. From on-time arrivals, super responsive, and our professionalism; S.A.A.B. Plumbing and Heating has proven time and time again that our jobs are done with quality workmanship and skill. During the inspection, our technician can also check the refrigerant level. This is not a task that should be performed by a homeowner since these chemicals can be dangerous to work with. Let the air conditioning service take care of this task, we will have the certifications required to safely work with these refrigerants. Keeping your air conditioner in good working order also saves you money, since it will run more efficiently and use less energy. In fact, the energy savings may even pay for the cost of service! Call today or use our contact form to set up an appointment with an experienced technician who can inspect and service your A/C unit.